Since my diet plan calls for eating small meals 5 times a day, I really look forward to eat meal and making it delicious. Grocery shopping is something I love to do, and perusing the isles is time well spent. I put a lot of time and effort into some of my favorite mini meals. I’m what you call a healthy snacking maven. I know the what the best options are for the best prices, and I live to share them with all of you. I’ll never suggest a product that costs $11 a jar (like coconut butter). I love coconut butter by Artisan but it’ unrealistic to repeatedly talk about it on here since it’s not the most practical item. Sometimes I get sent products to try out and I fall head of heels for them. When I discover they are too expensive, they end up getting cut from the blog. Dried Edamame: Crunchy and salty, this snack is perfect for on the go meal #2 or #4 of the day. I pair a handful with an apple or other piece of fruit many times. Sometimes, I’ll even add it to hummus to give a yummy crunch with carrots. I love dried edamame because it has less fat and more protein than most nuts! For 1/4 cup serving, the roasted edamame has 130 calories, 4 g of fat, 10 carbs, 8 g of fiber and 14 g of protein. I have had trouble finding them without being salted but you can find it in most natural food stores and regular grocery stores in the organic and natural sections. I also like to make my own trail mix with the edamame, including almonds, wasabi peas and raisins. Fig Butter with The Laughing Cow Light Creamy Swiss: This may not come as a shock to many of you, but I love a good fruit spread with my cheese. I limit my added sugar intake to only the best, and this people is well worth the treat. Trader Joe’s now sells fig butter! I’ve been obsessed with the fig butter samples at Whole Foods for quite some time now, but never bought the jam assuming it was probably pretty expensive. When I saw the new product’s debut at my local TJ’s, I bought the jar for $2.99! I picked up some Laughing Cow as well to make sure when the cheese was gone, I knew when to put the butter away! For 1 tbsp, the butter has 45 calories and zero fat. There are 5 ingredients in this jar: figs, water, sugar, lemon juice concentrate and pectin. I put it on toast, crackers, and rice cakes. The two also make a mean grilled cheese! The Simply Bar Peanut Butter Chocolate: While in New York City, I spotted these bars at the convenience store in Penn Station. I was about to buy one when I saw it was priced at $5! I bought a single serving of Fage greek yogurt instead which cost $5 unbeknownst to me prior to the register. As luck would have it, a few days later the company contacted me to see if I would be interested in trying their bars. I jumped at the offer and was excited to see that at most places these bars cost the same as the rest around $2-3. Damn you Penn Station and your price hikes. The bar is packed with protein and low in calories! For just 160 calories, these bars have 16 g of non GMO soy protein. 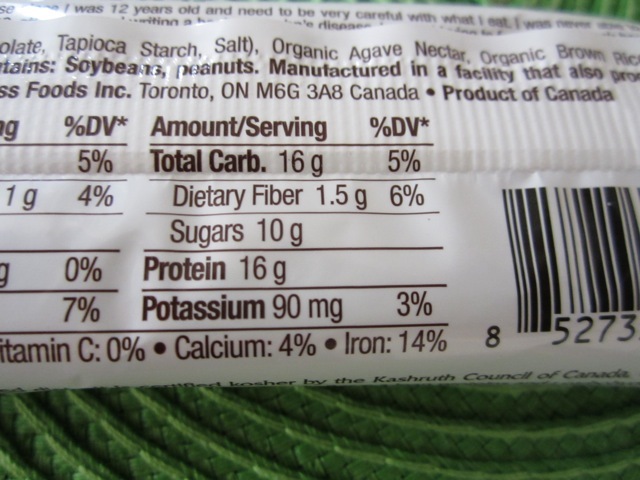 All ingredients are organic and there are only 9 or less of them in each bar. The bars are also gluten-free, easy to digest in case you have Crohn’s disease, vegetarian, rich in iron with over 20% of your daily needs and delicious! Crunchy and not too sweet, I loved every flavor they sent me but the chocolate peanut butter was my favorite! I will admit they were a tad dry but that just made me want to drink more water which left me feeling satisfied and full until my next meal. For $3, you can try one of the bars shipped to you for free via their website. The Simply Bar makes a perfect meal #2 or #4 on the college diet plan. What are you newest snacking obsession this fall? Have you discovered a new product you think I need to try? New Video Feat. Gluten Free Grocery Store Haul! I’m sure they have fig butter at least at most grocery stores right though? Heading to Trader Joe’s tomorrow, so excited to pick up Fig Butter!!! I LOVE their pumpkin butter and put it on just about anything 🙂 My fave combo is yogurt, banana, pumpkin butter. I love love their pumpkin butter! I actually stocked up at Halloween in case they stopped selling it. Always looking for new ideas to use it on. I haven’t tried Fig butter, is it sweet? yes it is, but not too sweet in my opinion. I haven’t tried to pumpkin! KIND bars are my new best friends! They can go anywhere; they are all yummy; and they are a great balance of calories and protein. Love the Laughing Cow cheese, too! KIND bars are my new best friends! Love to have them for a snack -- great balance of calories and protein. Also, love the Laughing Cow cheeses. . . I’m all about the snacks! laughing cow cheese looks so good!